How To Hook Me On A Comic: Matt Accidentally Writes About Justice League International #23, For Some Reason - Wait, What? I had these plans, right? Since I’ve been doing some reviews of comics elsewhere on the internet (as Jeff described in his way-too-kind introductory post, below), I’ve been fortunate enough to wind up receiving some review copies. But the amount of writing I was doing was pretty limited, and I am the sort of sad, neurotic person who starts feeling VERY GUILTY when people are sending me things to review and I am not reviewing them. I am, I think, one of the target audiences for this particular soft-relaunch/reboot thing. I used to read and enjoy DC comics, but I’d started tailing off in the years leading up to the New 52, and took the New 52 reboot as a chance to pretty much bail entirely. I finished out Morrison’s Batman stuff, kept up via library with Snyder’s Batman book and Johns’ Superman book, and generally found that the rest of the New 52 was of little interest to me. But as people (such as, for example, the two guys who run this site) called attention to the more recent efforts – especially Grayson, but also the new Batgirl stuff, the inexplicably enjoyable Injustice book, and the Pak/Kuder work on Action Comics — I found myself enjoying them, and intrigued by the wide variety in the relaunch. So when DC kindly sent copies, I read, and read, and read, and read, and read. And while I found a lot to enjoy, I also found a lot that, frankly, baffled the hell out of me. I’m not new to comics. I’m not new to DC. I’m not new to superhero universes or reboots or dramatic new changes of direction. This should not be hard for me. But as I was reading the new Green Lantern book, which features Hal Jordan on the run(?) with some kind of DIY version of a power ring(?) and a style makeover straight from Spirits-of-Vengeance-era Johnny Blaze(?!??!?! ), I found myself trying to figure out what the hell it is that makes me WANT to read a book that I have no immediate emotional anchor to. 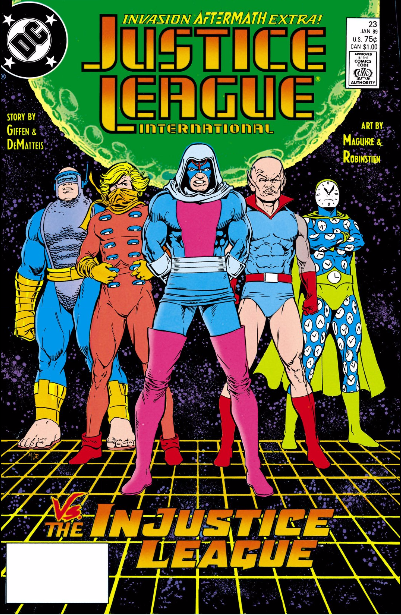 Which, in turn, made me think of the book that got me into DC comics the first time. Like most kids of my era (i.e. OLD PEOPLE NOW), my first comics were a scattershot mix of whatever my parents gave me to shut me up – some DC, some Marvel, some Archie … really, whatever was on the spinner rack by the register. But once I started picking out the books myself, I leaned hard toward Marvel, following the same path that hooked so many other American kids at the time: I started with the licensed books, moved to the X-books and Spider-Man stuff, got tricked into buying the New Universe, and so on. But I never really engaged with DC. Just didn’t care. Didn’t even give them a shot. There was no need to – the books I wanted from Marvel were already pushing the limits of my allowance, so why explore? Because sleepaway camp. When’s there’s no store to go to (and digtal comics are like 25 years in the future), you find the people with comics and you read whatever the hell they have, no matter how uninteresting it is. 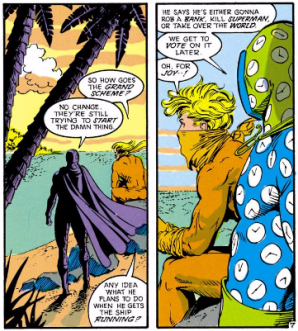 Which is how I wound up reading a copy of Justice League International #23, by Keith Giffen, J.M. Dematteis, and Kevin Maguire. I had basically a Super-Friends-level understanding of the DC Universe, and this wasn’t exactly a natural jumping-on point. It was an interstitial issue of the Invasion! crossover that featured the bwah-ha-ha era Justice League bickering and sifting through wreckage of an alien ship for 20 pages and vaguely battling a completely hapless version of the Injustice Gang, before culminating in a cliffhanger that had nothing to do with the action that had proceeded it. 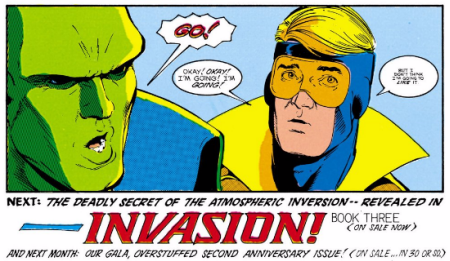 I knew nothing about any of the characters – maybe a vague understanding of Martian Manhunter, and I knew that Guy Gardner was not Hal Jordan – and wasn’t even particularly clear what the Invasion! thing was about. But I loved that one single issue enough that I started buying the book monthly as soon as I got home. I tracked down the back issues. I followed the spin-offs, and expanded from there back through Invasion! to Legends, where this incarnation of the team started (kind of), and outward to other DC books. So as I was sitting there the other day, trying to figure out why I was supposed to care about a new, more slender, less interesting incarnation of Lobo, I kept thinking about that issue of Justice League, and wondered why it had been so damned sticky when so many of these books just skidded off my eyes. And then I had the bright idea of going back to that very issue – the issue that DC’ed me – and trying to see if I could still spot what had grabbed me so hard all those years ago. (The obvious snarky answer is that it’s because that book was capital-G Good and these books were not, but I really don’t think that’s the case. Many of the DC YOU books that failed to capture me were objectively well-crafted, but whatever obsessive part of my brain has kept me coming back to comics for all these years just didn’t connect with them. Somewhat to my surprise, it kinda worked. At the very least I found a few commonalities that, it seems pretty clear, are ways to hook people (or me, at least) into a book. And while some of them were painfully obvious, at least a couple of them were things that I wouldn’t immediately have suspected. In DC YOU, Grayson is a book that really nails this balance, I think — knowledge of what’s gone before deepens the book, but it isn’t essential to enjoying the story. Maybe not coincidentally, Grayson also happens to be pretty good at the next item, as well. A little formalism is a really good thing. The talking head device above is pretty commonplace now (Bendis alone has probably done 1,200 similar scenes), but it was new to me at the time, and I totally loved it. The simple, simple trick of holding a static camera on these two characters for eight full panels as they just argued … it was something I remember really taking note of at the time. It helps to have an artist who’s an absolute master of facial expressions and physical acting like Maguire is, sure. But a big part of it is just choosing to approach a page that way. Grayson nails this, as does The Omega Men — Tom King seems like a writer who puts a LOT of thought into formalist experimentation; I feel like he probably writes incredibly detailed scripts. In fact, I wonder if the reason I felt like I hadn’t seen this sort of effect before, back in 1989, is because it’s tougher to pull off in Marvel’s plot-art-script writing style than in DC’s full script. Regardless of the reason, the DC YOU books that engaged in more obvious flourishes like this (including, off the top of my head, Constantine, Bizarro, Gotham By Midnight, even the Quantum-and-Woody-esque chapter titles in Starfire) all stuck with me much better than did the more straightforward Green Lanterns and Green Arrows and Red Hoods of the line. Cliffhangers work. Even if they’re really stupid non-sequiturs, as this one was. The fact that cliffhangers bring back readers is not exactly a groundbreaking discovery, but I had forgotten just how effective they could be — I went out and bought Invasion! #3 just to find out what the hell had happened here. I didn’t even bother finding Invasion! #1 and #2 until years later. The usual suspects continue to do cliffhangers well in the DC YOU (Geoff Johns, Scott Snyder), but the one that really stuck with me was Bryan Hitch’s last page reveal on the first issue of his JLA book, and he manages to nail another one this week in issue #2. 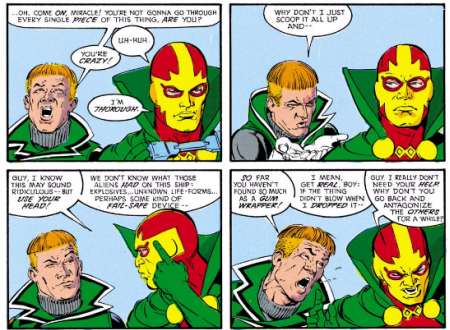 There’s a few more contributing factors, I think – humor was a HUGE draw for that JLI book, after all those years of misery and angst in the X-books, although the only DC YOU book that corresponds with is Bizarro. 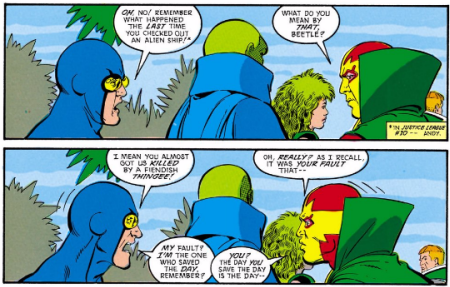 Somewhat weirdly, I’d also cite Bob Lappan’s lettering as something that I loved about the JLI run, and love to this day. 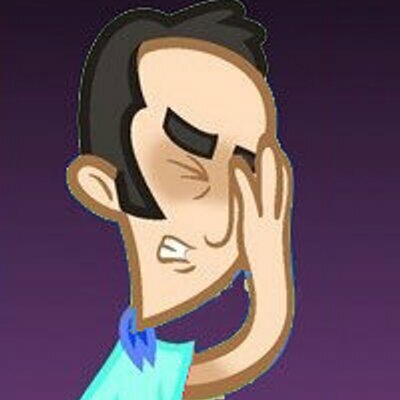 It appears that Bob Lappan does not letter any of the DC YOU books, which I feel comfortable calling a small tragedy. I dunno. Maybe all of this stuff says more about me than it does about what makes for a catchy comic – maybe this really is just a list of stuff that I like – but taking the time to revisit and ponder that issue really reframed how I found myself thinking about all these new DC YOU comics. Maybe next week I’ll actually manage to review some of them. Welcome, Matt! Other than making me feel old as dirt since my first comic was an issue of Justice League Detroit… This was an AWESOME first post! You made excellent, highly salient points. I would add to your list the idea of a writer having a STRONG VOICE, which Giffen/DeMatteis clearly did (and still do, I imagine). I think when you combine a distinct authorial voice with the formalistic chops you mentioned it is a winning combo that tends to lead to classic stories (Moore, Morrison, Lapham, Hernandez Bros, Clowes, et al). And yes, Bob Lappan’s lettering was a HUGE part of the charm and humanity of that book — he’s one of my three all-time fave letterers along with Workman and Bruzenak. The soul-crushing banality of the “font revolution” in comic book lettering is a whole other topic; in my view, the existence of the font in lettering in comics creates an irretrievable emotional disconnect between story and audience. Anyway, the point is: thank you kindly for a lovely and thought provoking post, Matt! Yeah, I think you’re absolutely right. Especially notably, I think you can really see that book as a product of two veteran writers finding a relatively new way to express themselves in superhero comics — I mean, it’s tonally as far from “Kraven’s Last Hunt” as it’s possible to get and still be in the same medium. Welcome, Matt! Well, you could not have had a more appropriate first post for me, personally. So consider me hooked on your work already. The Bwa-Ha-Ha League is my favorite version of the League, ever. And that initial Giffen/DeMatteis/Maguire run was pure gold. I recall fondly collecting the first several years of that series as they came out and being floored by the book. I think I’m about your age, Matt, and at the time JLI seemed so much, I dunno, adult, to me than a lot of other stuff I was reading. I know that might seem odd for a book most remembered for juvenile humor, but something about Maguire’s character designs and the way the members all talked to each other in such frank, honest, and above all else sarcastic ways, just struck me as the way adults must talk – because most of my friends and I and I were certainly not that sophisticated at that young age to be using sarcasm as well as the members of the JLI did! So there was something about this book that made me excited to be an adult – you could joke with your friends and not get yelled at by teachers!! You could hang out with gorgeous women who also had amazing senses of humor and would verbally spar with you too!! Amazing!! Very aspirational stuff. I count this and several other pop culture artifacts of the era (sitcoms like Taxi and Bosom Buddies, movies like Midnight Run and anything starring Michael Keaton) as reasons why I grew up to wield sarcasm as my weapon of choice. So, enough about me. More about comics! Matt, I’m curious, you mentioned the good use of cliffhangers in Bryan Hitch’s new JLA book. I was very curious about this book but am a bit ashamed to admit I let an employee at my LCS (whose opinions on comics typically dovetail nicely with my own) talk me out of checking it out. I love the Justice League (in almost all of its iterations) but I’ve been away from the book for a long time, as the New 52 version left me cold. So the LCS staffer and I were looking through the first issue of the new JLA and he snarked on how it seemed to be more of the same from the New 52 version of the team. But damn if Hitch’s art isn’t really pretty in this book (from what I’ve seen). Anyway, what are your thoughts on the first two issues? I might wait for a trade on it at this point. I’d also be curious to read a more thorough breakdown of your reviews of the new DC You books you’ve read (and it sounds like you’ve read most of them). I realized in reading your piece that I had every intention of picking up some new DC You books but haven’t done so yet. Green Lantern Lost Army intrigues me, along with Omega Men. Looking forward to your weekly reviews. Thanks! I’m hoping to do more with the DC books moving forward, for sure. This really was a case where a bit took over the whole piece. Probably next time. I thought JLA was pretty much the opposite of (what little I’ve read) of the New 52 Justice League — it doesn’t feel to me like it’s part of any chronology, honestly. It feels almost an “Ultimate” or “All-Star” JL to me, just a big, widescreen story using the characters. I’ve never read Hitch’s writing before, but the characters sound on-form and the story moves briskly enough. (Something about the second issue especially felt somewhat derivative of Morrison’s opening arc on JLA, but in a breezy, pleasant enough way.) I’m not sure it’s worth the high price point, but it felt like rock-solid DC superhero comics. Omega Men is great, but difficult to summarize in brief. (Graeme & Jeff have talked about it in some detail on the podcast, though.) Tom King is a writer who has quickly moved onto must-at-least-check-out list. Green Lantern Lost Army is one of the ones that I read and that skidded right out of my brain, but I’ve been off Green Lantern since pre-New 52 and this felt a lot like a continuation of a pre-Convergence status quo in a way that I didn’t fully grasp. Thanks, Matt. I’m noticing a lot of love for Tom King recently…but I can’t seem to remember what he’s writing besides Omega Men. Is he doing Grayson? Anything at Marvel? I think I confuse him with another writer sometimes, but I can’t even remember who that is. Too much comics nonsense floating around in my brain. I’ll be keeping my eye on the DC You books (especially JLA) and keeping up with your reviews. Then maybe I’ll dive in and sample a few as well. Yeah, Tom King is doing Grayson and Omega Men right now, plus a Vision book that was just announced as part of All-New, Mostly-The-Same Marvel, and some kind of military/cop in Baghdad book through Vertigo. From what I’ve seen so far, he’s a writer who really puts a lot of thought into layout and design and formalist exercises (the Grayson: Future’s End special being the prime example). Not sure who you confuse him with, but *I* confuse him with Tom Taylor (Injustice, Earth 2, Superior Iron Man) who is ALSO better than everyone expected him to be. I also sometimes get some of the guys named Tim mixed up with this. Holy cow, you just word-for-word described my childhood mid-to-late 80’s comic book reading experience. Random stuff (Archie, old FF and Superman digests), led to GI Joe and Transformers, led to New Mutants and X-Men (and some Spiderman), led to Spitfire and DP7 from the New U, And why would I bother with DC (aside from a few random outliers like Forgotten Realms and later Giffen’s 5 Years later Legion)? Eventually took guys like Matt Wagner and Sam Kieth, and the Valiant experiment and early manga imports like Akira and Ranma, to start opening my mind to the larger world. Yup. I could probably point to pretty specific issues at each stage of the way, each one broadening my interest in comics and then ultimately costing me thousands of dollars. Maybe something for a future post. Great old commercial, don’t remember ever seeing that. 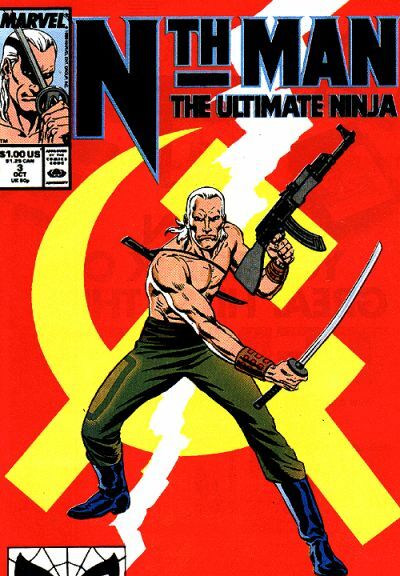 Curious if you ever followed Larry Hama to that old treasure, Nth Man. I remember trying one issue kinda at random (number 3, looks like — http://img2.wikia.nocookie.net/__cb20100921125533/marveldatabase/images/0/08/Nth_Man_Vol_1_3.jpg ) — and having it do pretty much the opposite of what JLI #23 did. No stickiness at all for me. I was quite taken by your thoughts on continuity and tying things in to what happened before. I wonder sometimes if the most effective way to navigate through a shared universe is to suggest more than delineate. I seemed to remember my fire for working out the various ins and outs of the DC and Marvel universes seemed strongest when it felt like there were bits I’d never quite see all of, but they were there, like a big holiday where you couldn’t possibly do everything, but you sure as heck wanted to. That’s a really accurate analogy. Part of it, I suspect, is being the right age for it, but there really was something to finally reading stories that I had been seeing referenced for ages (“As seen in the legendary X-Men #137!”). It’s such a delicate balance, but deployed judiciously I think it can be a very good thing. Still have that. Started reading X-Men around Fall of the Mutants, dropped off in the 90s when Lee/Lobdell/Nicieza took over. Recently, on a whim I’ve been using Marvel Unlimited to read the entire run up to where I originally picked up (along with other seminal runs like Tomb of Dracula, Howard the Duck, the original FF, etc. ), and it’s been interesting to finally read major events that I had repeatedly heard described in the books and then re-imagined for years (stuff like Storm losing her powers, Proteus, the original Brood stories). Marvel Unlimited is amazing for things like that. I found and read a Byrne/Claremont issue of X-Men that I had somehow never seen before, which was a transcendentally weird comic book experience to have in 2015. I’m also using Marvel Unlimited right now to catch up on classic Claremont X-Men. Somehow I missed the stretch where Cockrum returned (original Brood Saga) so I’m digging into that now. Tomb of Dracula is one I’m eagerly awaiting reading on MU also–I read a handful of issues of that one as a kid and loved it. Also hoping to finally read Fraction and Brubaker’s Immortal Iron Fist.